…And it’s like a case-study of almost everything clinics should do from a digital marketing and web design perspective to vastly improve the chances of visitors booking in for an appointment when they’re shopping around for a provider. 1. Simple, strong, clear benefit statements. These should be in simple language, using words that your clients might use and try to highlight both functional and emotional benefits (e.g. 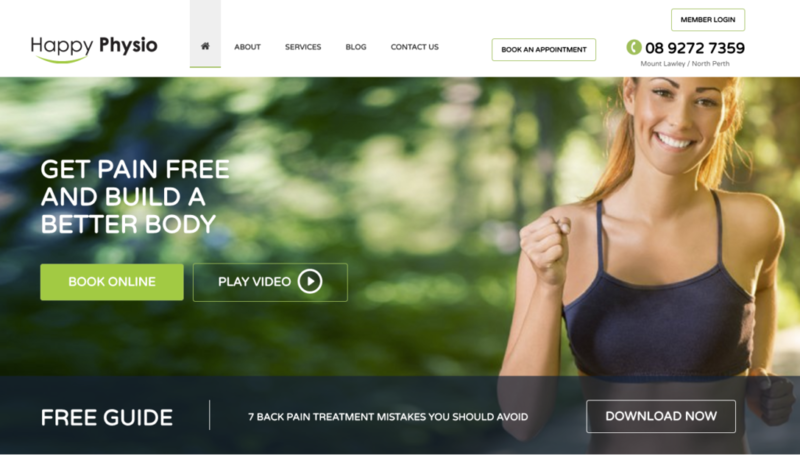 the phrases “pain free” AND “better body” like this physio has used)—not any industry jargon. It should also be in direct conjunction with a call-to-action (e.g. “book online”) and, ideally, also a secondary “funnel” type call-to-action (e.g. “watch video”) for those who aren’t quite sure they want to book in yet. 2. Email marketing opt-in and autoresponder. This might include a simple free health “how-to” download ebook or, better still, a mini-course in exchange for their email address. Then the recipient gets an automated email (or short series of emails) that give loads of value and personality and encourage them to book in or buy something (if you have products that you can sell and ship out?). Plus, if the opt-in form includes postcode, you’ll know who’s a real prospect and could potentially feed their details into a direct follow-up list. 3. Clear list of conditions that you can help with. I think this is pretty self-explanatory, right? 4. Friendly, professional welcome video. Video is the #1 way to connect with people online—there’s nothing like it in terms of making people feel comfortable with you before they pick up the phone, and indeed increasing the likelihood of them doing that at all. In some experiments, videos have been proven to increase the conversion rate of a website by up to 80% or more. 5. List any and all “authority” signals. This might include books/courses by practitioners, press coverage, well-known event participation (as a speaker), and any major client logos. Even a short, helpful eBook can convey “authority” if presented in the right way. Also, if you’re aligned with any important organisations, then show those logos on your homepage. 6. Positioning practitioners as “experts”, not just “regular” practitioners. Similar to the “authority” signals above. This is just simple framing with words, but can totally change perceived level of value in a high-competition vertical like healthcare. OK, that’s it! I hope this was helpful? If you’re keen to implement some of these ideas straight away, then of course I’d be glad to assist. Please just drop me a line and we can discuss some options!